"Where Earth and Sky Meet"
Today's story is the seventh episode of a series named "Love Stories From the Land of Many Lakes." It's a collection of love stories provided with jewelry images and illustrations of artwork by myself as well as by kindred artists. The stories are based on aadizookaanan (traditional stories) of our People, the Ojibwe Anishinaabeg of Gaa-zaaga'eganikaag, the land of many lakes - the Great Lakes area of North America. These narratives are of a sacred, healing nature and told within a romantic context, their allegorical themes often provided with a personal touch. Today's story is woven around an (as yet unfinished) painting by Simone McLeod, titled Earth and Sky, an acrylic canvas titled The Sleeping Giant by my friend, the late Moses Amik, and two sets of wedding rings designed and handcrafted by myself, made with different materials yet provided with similar designs and a shared theme. The theme of the rings, two lovers meeting in a special, magical sphere where sky and earth meet, is inspired by the dramatic, imagination-stirring silhouette of Nibaan Misaabe, the Sleeping Giant. The Sleeping Giant is a formation of mesas and sills on Sibley Peninsula which resembles a giant lying on his back when viewed from the west to north-northwest section of Thunder Bay, Ontario, Canada. The warm light of New Beginnings. Nisawayi'iing akiing idash giizhigoong mii ji-mikaman gido'ojichaakam. "Between the earth and the sky you can find your soul." 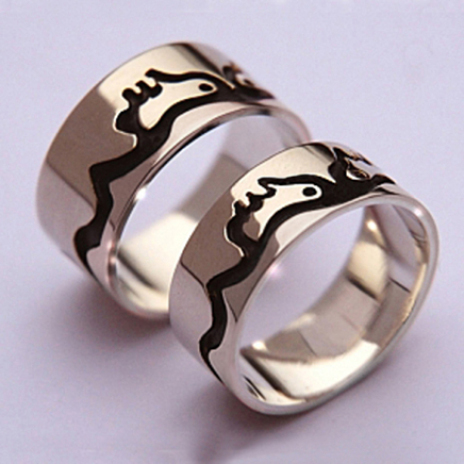 The designs of these unique sets of gold and sterling silver wedding rings were created in the pictographic outline drawing style of the Medicine painters, who paint in the Native Woodland School Of Art discipline. 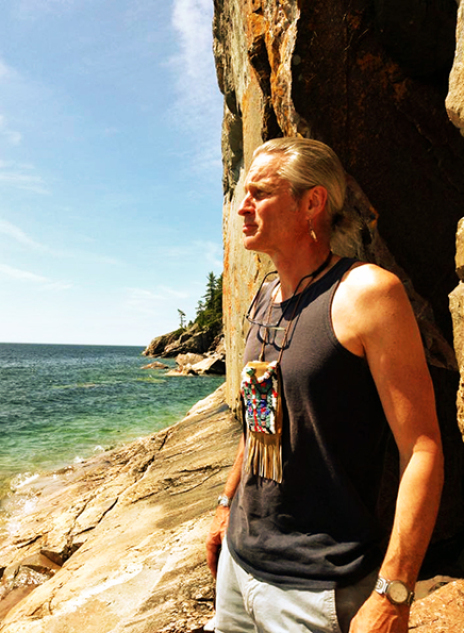 The dramatic outline of the Sleeping Giant, a rock formation that rises high above the waves of Thunder Bay in Lake Superior, is a prominent source of design inspiration for jeweler Zhaawano. The two halves of the ring exteriors, divided by a flowing, oxidized outline inspired by the silhouette of the Sleeping Giant, represent the bodies and spirits of two soul mates becoming one with each other and with Aki, the Earthmother and Giizhig the Earthfather. 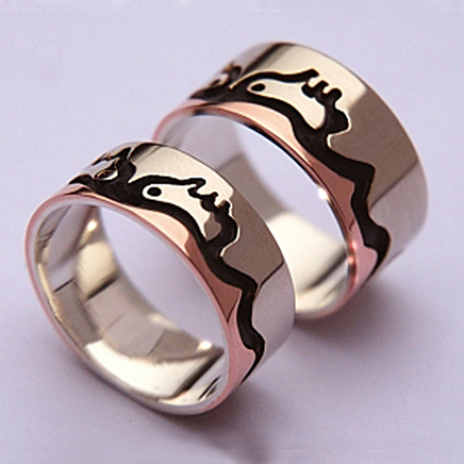 The image to the right shows rings that were entirely constructed from sterling silver; to the left we see rings with exteriors consisting of one half in 14K white gold (representing the sky) and the other half in 14K red gold (representing the bodies of the lovers and the earth they are part of). > Click the images to see details of the wedding band sets! Who is Nibaad Misaabe and where did he come from? Who is Nibaad Misaabe and where did he come from? According to a local Anishinaabe tradition, this majestic rock formation jutting out of Animikii-wiikwedong (Thunder Bay) – a body of water that forms the head of Gichigami, or Lake Superior - is the petrified body of Wiinabozho. 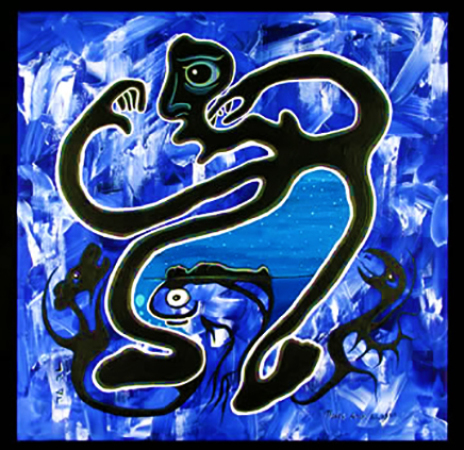 Wiinabozho, who was truly fond of the Anishinaabeg – the Ojibweg of Miinoong (Isle Royal) for instance, gave him a prominent role in their storytelling and honored him with the honorary title of the Spirit of the Deep Sea -, had gifted them with a mine rich with a vein of pure waabishki-zhooniyaa asiniiwaabik (silver ore). According to tradition, GICHI-MANIDOO, the Great Mystery, had warned the Anishinaabeg not to reveal its location (now known as Silver Islet) to strangers, or Wiinabozho would be turned to stone. But one night a canoe guide of the Bwaanag (Dakota Nation) did disclose the secret, and the European intruders whom he led to the mine were drowned in a fierce storm that lashed the bay, leaving behind the poor scout in a crazed state of mind, aimlessly drifting along in his canoe. The next morning, tayaa! the horrified Anishinaabeg, who for many generations had used the silver of the mine to craft jewelry and ornaments and tools that brought them much material wealth, noticed that, where once used to be a wide opening to the bay, now lied what appeared to be a sleeping figure of a giant! Wiinabozho, hurt and ashamed, had been turned into rock overnight…GICHI-MANIDOO’s warning had come true and the beloved manidoo of the deep waters had been turned to stone for eternity…or will he perhaps awaken one day? Mii sa ekoozid. Miigwech gibizindaw noongom mii dash gidibaajimotoon wa’aw zaagi’iwewin-aadizookaan. And that is the end of the story. Thank you for listening today, for allowing me to relate to you this sacred love story. Giga-waabamin wayiiba, I hope to see you again soon. Zhaawano Giizhik, an American currently living in the Netherlands, was born in 1959 in NC, USA. Zhaawano has Anishinaabe blood running through his veins; the doodem of his ancestors from Baawitigong (Sault Ste. Marie, MI) is Waabizheshi, Marten. As a second- generation Woodland artist who writes stories and creates graphic art and jewelry designs, Zhaawano draws on the oral and pictorial traditions of his ancestors. For this he calls on his manidoo-minjimandamowin, or "Spirit Memory"; which means he tries to remember the knowledge and the lessons of his ancestors. In doing so he sometimes works together with kindred artists. To Zhaawano's ancestors the MAZINAAJIMOWINAN or "pictorial spirit writings" - which are rich with symbolism and have been painted throughout history on rocks and etched on other sacred items such as copper and slate, birch bark and animal hide - were a form of spiritual as well as educational communication that gave structure and meaning to the cosmos that they felt they were an integral part of. Many of these sacred pictographs or petroforms – some of which are many generations old - hide in sacred locations where the manidoog (spirits) reside, particularly in those mystic places near the lake's coastlines where the sky, the earth, the water, the underground and the underwater meet.